I love visiting the Wildwoods with my favorite area being North Wildwood in New Jersey. Many people don't realize that the Wildwoods is actually an island made up by several coastal communities. You have North Wildwood, Wildwood, West Wildwood, Wildwood Crest and an area called Diamond Beach. The prettiest places on the entire island to view the Atlantic Ocean (at least in my honest opinion) happens to be in North Wildwood as you walk along (on) the seawall. When we first started going down there on vacation in 2000, this seawall was non-existent. A few years later they added it in and boy...I'm so glad that they did! It's completely paved with cement and it's flat, so it makes for an easy walk. It runs right behind the Hereford Inlet Lighthouse if you're familiar with that particular area. There are some benches along your walking route that you can sit on to take in the beautiful views of the Hereford Inlet and the Atlantic Ocean. There are two areas on the seawall that have covered seating areas. I call them gazebos and they are relatively close to one another. It's nice to sit under those covered seating areas on blistering hot days to get into the shade or during rainy days when you still want to sit out and watch the ocean waves roll in. If you enjoy sitting down and looking for the dolphins, this is a great area to be in. On the one corner of the seawall you'll find front-row seating and that is usually where we sit when we want to dolphin watch. We can sit there and spot the dolphins swimming by a few times every week, just as long as the surfers aren't in the water when we are there. If the surfers are around, it's much tougher to spot them. 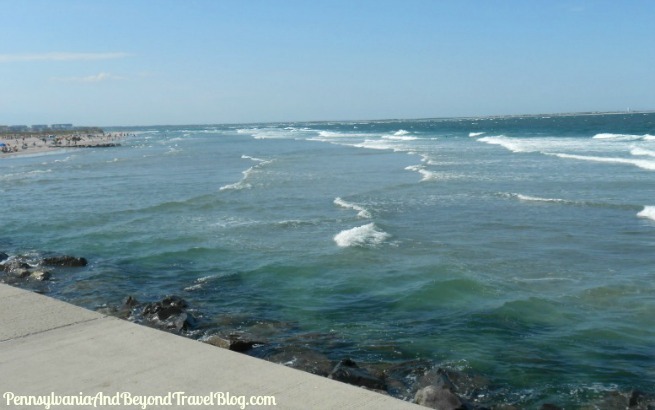 This area of the Wildwoods island has the prettiest scenic views of the water and beaches. In addition, it's a LOT less crowded on this section of the island as compared to Wildwood and Wildwood Crest. Plus, you don't have to walk a mile to reach the water's edge...it's only a few yards away. Great for those of you who want to walk the beach and go shelling too! If you enjoy watching the shorebirds, then this area is great for that too! We often spot Egrets, Cranes, Seagulls and other native birds sitting on the beach or the rocky area that runs along the seawall. If you walk by quietly or sit quietly, you can get up pretty close to them. They do request that you don't toss them any human foods! If you look closely at the photo above (click on it to open it in a new window & in an enlarged size) you can see one of them sitting on the rocks, looking for something to eat. After you've spent some time here, you can find some local eateries nearby to grab a bite to eat. We like Westy's Irish Pub, Keenan's and a few others that are in the area. You can visit the Hereford Inlet Lighthouse and walk through their beautiful botanical gardens for free. If you want to tour the inside of the lighthouse, you'll have to pay a small admission fee for that. If you're heading down to Wildwood and looking for the prettiest beachfront walking area, this is definitely the place you want to be! I agree with you . This would be one of my favorite spots. I love the flat surface of the seawall walk and the ability to visit the lighthouse or see dolphins.